Wheat is the number one crop grown in Oklahoma. Most of the wheat grown here is hard red winter wheat. This is the kind of wheat that grows best in our climate and in states like Kansas, Colorado and Texas. Hard red winter wheat is used mostly to make bread. The most common varieties of hard, red winter wheat planted by Oklahoma producers are Jagger, Endurance and Overley. Other kinds of wheat grown in the US include durum, a very hard, translucent, light colored grain used to make semolina flour for pasta; hard red spring wheat, a hard, brownish, wheat used for bread and hard baked goods; soft red winter wheat, a soft, brownish, wheat used for bread; hard white wheat, a hard, light colored, wheat used for bread and brewing; and soft white wheat, a soft, light colored, used for bread. In 2003, Oklahoma ranked number two in the nation in the production of hard red winter wheat. Wheat is the primary grain used in U.S. grain products approximately three-quarters of all U.S. grain products are made from wheat flour. U.S. farmers grow nearly 2.4 billion bushels of wheat on 63 million acres of land. About half of the wheat grown in the United States is used domestically. Wheat is grown on more land area worldwide than any other crop and is a close third to rice and corn in total world production. In 2004, world wheat production was approximately 624 million tons. Wheat is well adapted to harsh environments and is mostly grown on wind-swept areas too dry and too cold for rice and corn. Unlike most other crops, hard red winter wheat is planted in the fall and harvested in the spring. tractor that pulls the plow through the fields. The plow turns the soil over and kills all the weeds. Then the farmer connects the tractor to a disk harrow and drives it over the field. The disk harrow breaks the soil down into smaller pieces. When the soil is ready for planting, the farmer uses a grain drill to plant the seed. When the weather gets cold the tiller will stop growing. This is called the dormant period. On most farms in the Great Plains cattle feed, or graze, on the young wheat plants while they are in their dormant period. The plants grow back. They are not damaged by proper grazing. In the spring, the warm moist days make the wheat plants grow quickly. As the wheat comes out of its dormant period, more tillers of wheat emerge. Each tiller can form another head of wheat. Some varieties of wheat grow as tall as seven feet, but most are only between two and four feet tall. During the early summer, the plants begin to fade from dark green to tan and then to a golden brown. Then the wheat is ripe and nearly ready for harvest. Now the wheat producer must race with the weather to get the wheat out of the fields. Some years the wind and rain keep the plants from ripening, and they cannot be harvested. Other years hail may break all the heads, or a lightening storm may start a range fire. When the weather cooperates, and the wheat is ripe, the farmer must move fast. He checks the wheat by rubbing a wheat head between his hands, blowing the chaff away and then chewing some of the grain. If the kernels crack easily and get soft as they are chewed, the wheat is ready to harvest. The farmer drives a combine across the fields to harvest the grain. When the storage bin of the combine is full, he empties it into a truck. Someone else drives the truck to the grain elevator in town. Domestic wheat originated in southwest Asia in what is now known as a the Fertile Crescent. 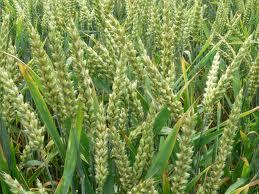 The oldest archaeological evidence for wheat cultivation comes from Syria, Jordan, Turkey, Armenia, and Iraq. Around 9000 years ago, wild einkorn wheat was harvested and domesticated in the first archaeological signs of sedentary farming in the Fertile Crescent. Wild einkorn wheat still grows in the Fertile Crescent. Around 8,000 years ago, a mutation or hybridization occurred within emmer wheat, resulting in a plant with seeds that were larger but could not sow themselves on the wind. While this plant could not have succeeded in the wild, it produced more food for humans. In cultivated fields this plant outcompeted plants with smaller, self-sowing seeds and become the primary ancestor of modern wheat breeds. Columbus packed wheat on his ships on his second voyage to the New World. While wheat was grown in the United States during the early colonial years, it was not until the late 19th century that wheat cultivation flourished, owing to the importation of an especially hardy strain of wheat known as Turkey red wheat. Russian immigrants who settled in Kansas brought Turkey red wheat with them. In 2004 the world leaders in wheat production were China (91.3 million tons), India (72 million tons), United States (58.8 million tons), Russia (42.2 million tons), France (39 million tons) and Australia (22.5 million tons). Wheat supplies about 20 percent of the food calories for the world’s people and is a national staple in many countries. In Eastern Europe and Russia, over 30 percent of the calories consumed come from wheat. About 1/3 of the world's people depend on wheat for their nourishment. of any other single food staple. A kernel is a wheat seed. There are about 50 kernels in a head of wheat and 15,000 to 17,000 kernels in a pound. Both whole wheat flour and all-purpose (white) flour are made from kernels of wheat. A wheat kernel is divided into three major parts—bran, endosperm and germ. All purpose flour is made from only ground endosperm. Whole wheat flour is made by grinding the entire wheat kernel. A bushel of wheat yields about 42 pounds of white flour or 60 pounds of whole wheat flour. A bushel of wheat weighs about 60 pounds.